Cab Packs feature a collection of MESA IR cabinets meticulously captured by Audio Engineer Sean Beresford. MESA/Boogie has announced the introduction of the World Tour and Studio Legend Impulse Response (IR) Cabinet Packs, available exclusively through Two Notes Audio Engineering for Wall of Sound, Torpedo Live, C.A.B. and Studio. Watch a video below to learn more. From the company: There are often times when using a speaker cabinet isn’t practical or even an option. Late night recording sessions in a home or apartment studio, limited performance space, or the need for a quick portable solution for going direct are just a few scenarios. The demand for sound-worthy alternatives continues to drive technology, and consequently the way we capture and record electric guitar. With much greater accuracy than earlier cabinet simulation devices, Impulse Response (IR) technology has evolved to more closely capture the relationship between and tonal impact of speaker, cabinet and microphone on an amplified instrument signal. For most players, IR now delivers a more authentic rendering or digital snapshot of how a certain cab and microphone sounds when the real thing is not an option. With an IR cab, once captured and loaded into a digital workstation, musicians can plug a guitar line-level signal back into a workstation and access the sound profile anywhere they choose. The possibilities are seemingly endless. With an IR Cabinet, no physical speaker or space is needed. Imagine capturing the tone from your favorite 100 Watt head, cranked through a 4x12 cabinet in a specific sound environment, captured with a blend of your favorite microphone(s), all available for tracking in a home studio or apartment late at night, at minimal volume. With IR cabinets, this is now possible. Understanding that the key to delivering the ultimate digital reproduction of their legendary speaker cabinet sound is in the capture, MESA turned to former MESA Artist Relations director (1990-2000) and now audio engineer, Sean Beresford, to handle the all-important capture duties. “After a decade of helping artists build their rigs and great tone, Sean followed his passion for audio engineering and has built a strong reputation as a highly respected engineer in the San Francisco Bay Area. His early tech experience includes working with artists such as Mark King of Level 42 and Vernon Reid of Living Colour. He offers decades of real world experience and a deep knowledge of Mesa products…he’s the perfect choice for the meticulous task of capturing the sound of our cabinets,” said Doug West, Director of Marketing at MESA/Boogie. Looking to team with an IR technology company capable of delivering the highest quality final product and user environment, MESA turned to Two notes Audio Engineering. Two notes is a leader in IR technology and their proprietary convolution approach is recognized for delivering premium quality captures for both live and studio applications. A dedicated MESA owner and user, Two notes founder and CEO Guillaume Pille is excited to work with MESA on the new IR Cab Packs. 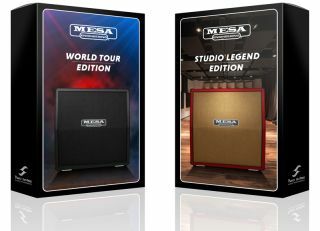 The new MESA IR Cab packs have been divided into two categories and applications - the World Tour Edition and the Studio Legend Edition. The same seven cabinet options are available in each pack while different microphones were used for each pack to reflect ideal mic applications for both live and studio applications. The cabinets represented include MESA’s 1x12 Thiele Front Ported Compact, 1X12 Recto Closed Back, 1X12 Lone Star 23, 2x12 Lone Star, 2X12 Recto Horizontal, 4X12 Recto Traditional Slant and 4X12 Recto OS Standard Slant. The World Tour Edition microphone selection consists of six dynamic, one ribbon and one condenser microphone, including the most popular mics for live performance capture. The Studio Legend Edition cab pack features four ribbon and four condenser microphones, including hand-picked, iconic, studio microphones often only available in high end recording studios. Between both packs, users will have IR representations of a selection of microphones used for some of the greatest recorded guitar tones in history. Both of the MESA IR Cab packs reflect the most accurate IR captures for MESA cabinets available to date, approved and fully endorsed by the company that brings you unparalleled excellence in speaker cabinet design, manufacturing and tone. To learn more about the MESA/Boogie World Tour and Studio Legend IR Cab Packs, head over to mesaboogie.com.